Traveling west from the Trancas Street Bridge (across Milliken Creek) is a huge vineyard. On the other side is the rather plain-looking Trancas Street Bridge (21C0003) across the Napa River. It's a three span 'T' girder bridge that was built in 1960. Today, Napa County is very committed to the production of wine. However, 100 years ago it was more involved in mining. An interesting book, "Mines and Mineral Resources of the Counties of Colusa, Glenn, Lake, Marin, Napa, Solano, Sonoma, and Yolo" was written by Walter Bradley of the California State Mining Bureau and published in 1915. It describes mining operations including the mining of stone from the Wing Quarry, which was used for the construction of the Trancas Street Bridge across Milliken Creek and the old Trancas Street Bridges across the Napa River. 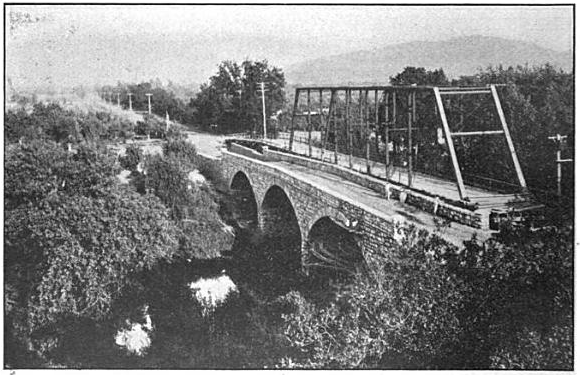 Bradley writes, "The Big Trancas” and “Little Trancas” bridges near Napa, Napa County, were constructed from the light, yellowish to gray, trachytic tuff quarried from the Wing Quarry (Newman) located on the Berryessa road about 6 miles northeast of Napa." The Big Trancas Bridge was a three span closed spandrel arch bridge but there's no mention of the single span through truss sitting beside it. The arch bridge was built in 1913 and both bridges were replaced in 1960 by the current 342 ft long by 64 ft wide 'T' girder bridge. Napa County, California Bridges: Trancas Street Bridge across the Napa River by Mark Yashinsky is licensed under a Creative Commons Attribution-NonCommercial-NoDerivatives 4.0 International License.